What better way to wake up in the morning than knowing that, taste-wise, you will be eating the equivalent of a candy bar for breakfast while getting all the nutrition needed to supercharge your day? That’s exactly how I felt this morning, knowing that yesterday I had experimented with creating an Almond Joy-type smoothie and today I had some ideas to perfect it! 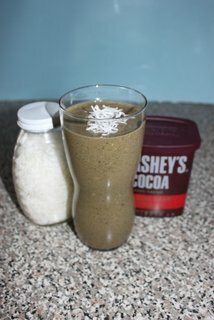 This smoothie replicates the flavors in an Almond Joy bar. The chocolate flavor comes from cacao, the almond flavor from almond butter and almond extract, and the coconut flavor from coconut milk and unsweetened coconut flakes. What about the fruits and veggies? Those come with the addition of a handful of spinach and a frozen banana, while calcium comes from the coconut or coconut-almond milk. And I also like to add some hemp protein powder for some extra protein, but that’s optional. All the goodness of the candy bar, replicated with healthy ingredients! Combine in blender and enjoy your smoothie! Sprinkle with extra coconut flakes if desired. Makes one tall glass (about 2 cups).